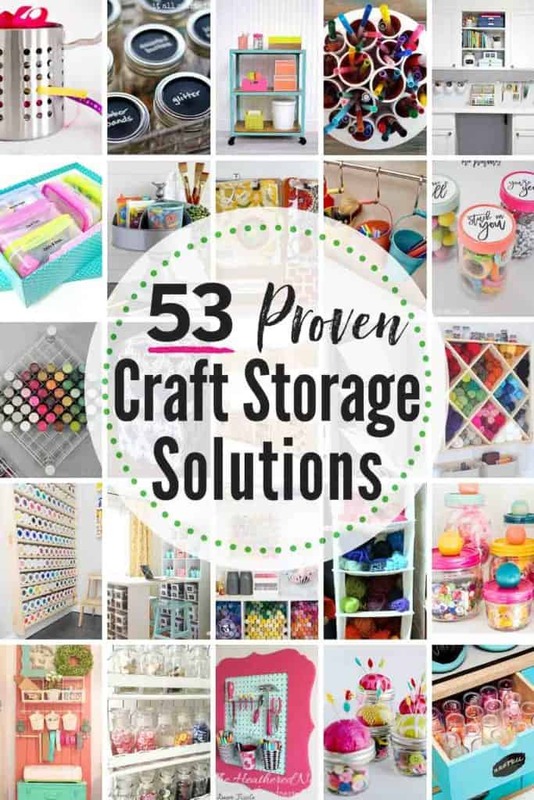 53 BEST Craft Storage and Organizing Hacks to Help Corral the Chaos! Crafting is great. Craft organization though? 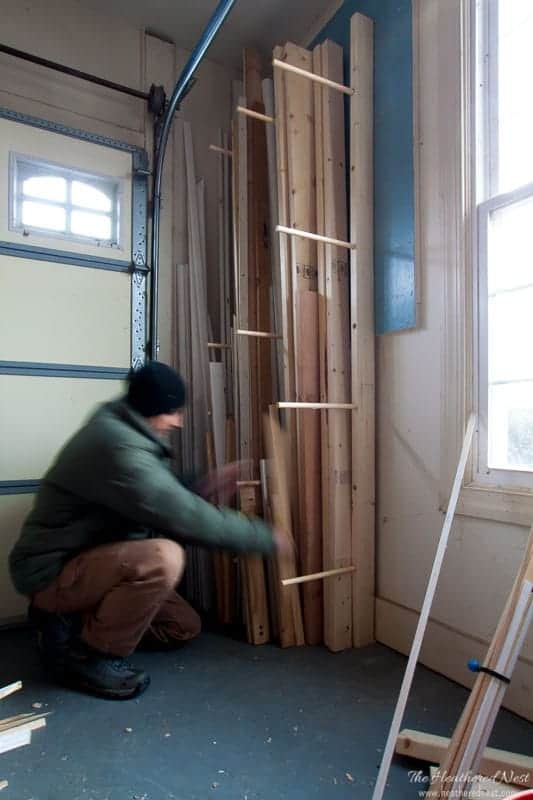 Finding great craft storage ideas and solutions? That part can be not as great. 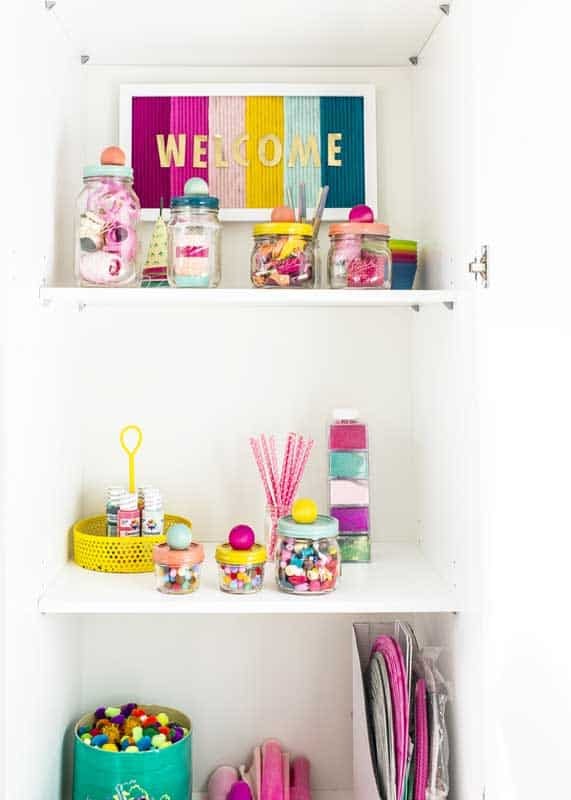 You probably stock up on all those little crafty things like glitter and googly eyes. 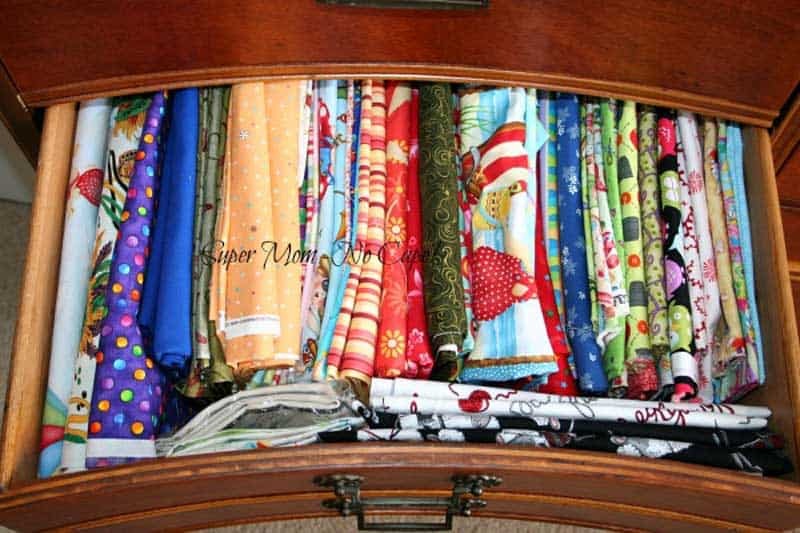 Items like fabric and felt, paints and pens, scrapbook paper and scissors. 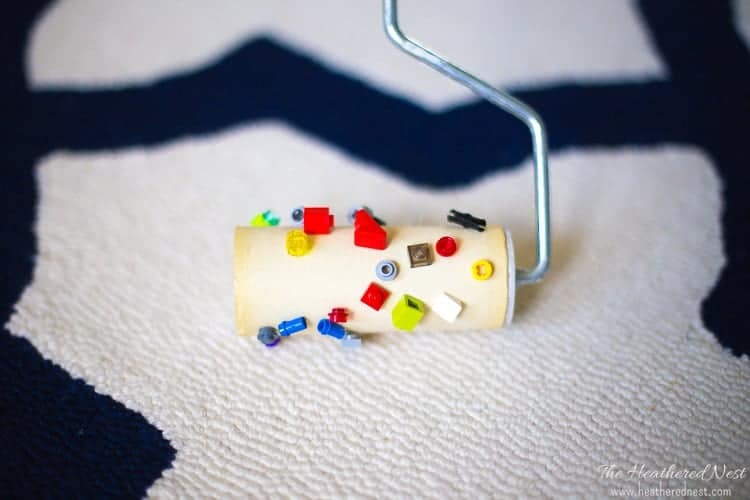 Little things like that can add up quickly to equal one giant, mess-o-crafts. 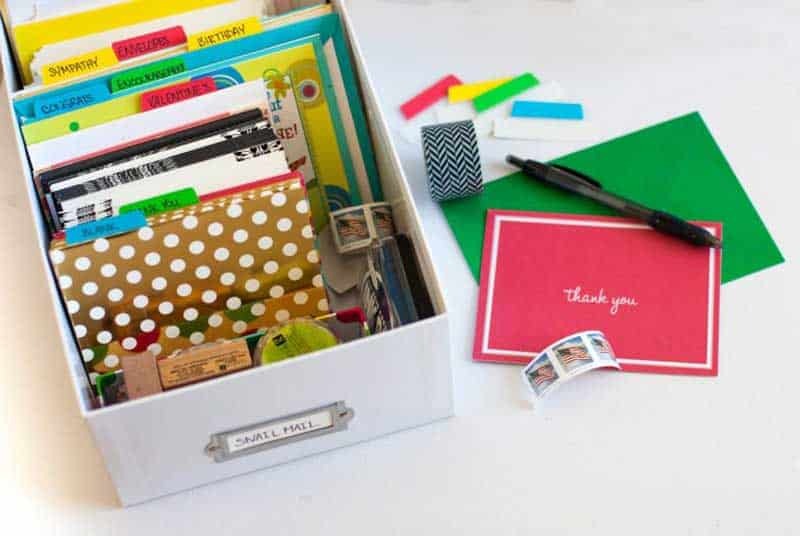 We need craft organization and craft storage ideas to corral the chaos. So I reached out to some of the craftiest folks I know. 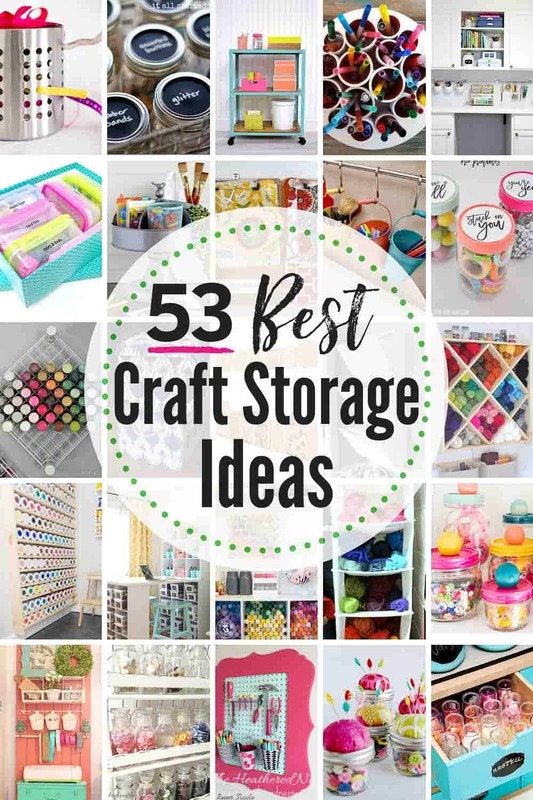 Home, craft and DIY bloggers and asked them for their best craft organization and craft storage ideas, and that’s how this list of 50+ INCREDIBLE ideas was born. I hope that you get some great inspiration here. And if you love any of these ideas and want to pin them, please pin individual images below from the creator’s blog. All the sources are linked! 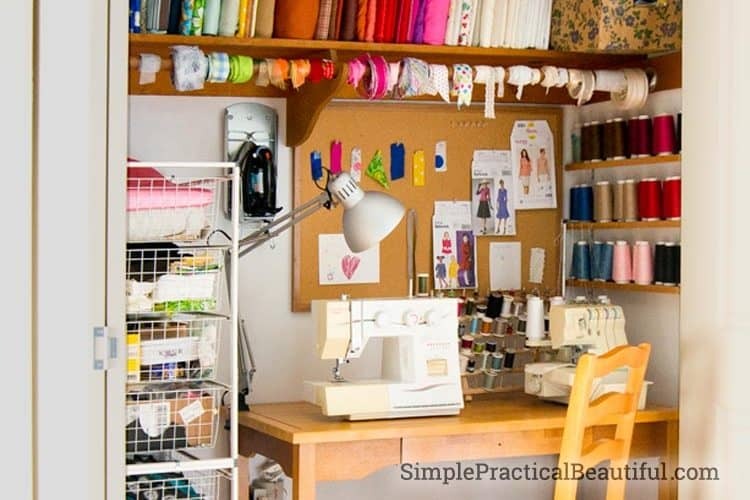 Angie’s craft room is like heaven on Earth for crafters. Not only does she have everything, but everything has a place. It honestly gives me a little Wayne’s World “we’re not worthy” moment when I take a virtual tour around this space. 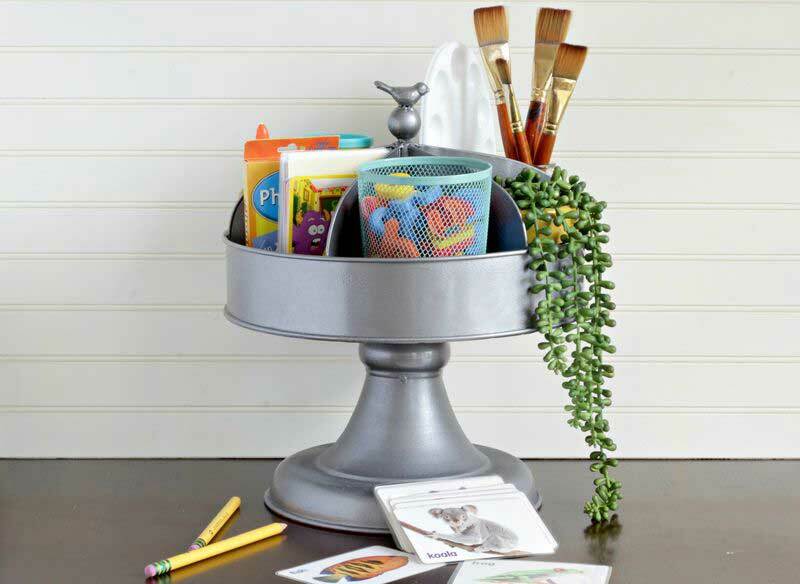 There are plenty of organizational and craft storage ideas in here for all. So I’m not completely inept when it comes to organizing my stuff. I’ve had three ideas in my lifetime on this subject. Not one, not two, but THREE! So of course, I’ve linked them all here to make it seem like I’m totally in control of my clutter. Hush. I enjoy having these breaks with reality from time to time. Anyways, I made this ribbon organizer out of a $2 item from Ikea. YUP…$2. Honestly, I just wish I had this much baker’s twine to organize. I had no idea it came in so many colors, but sure enough, I searched around and found it in at least 12 colors! Amazing. 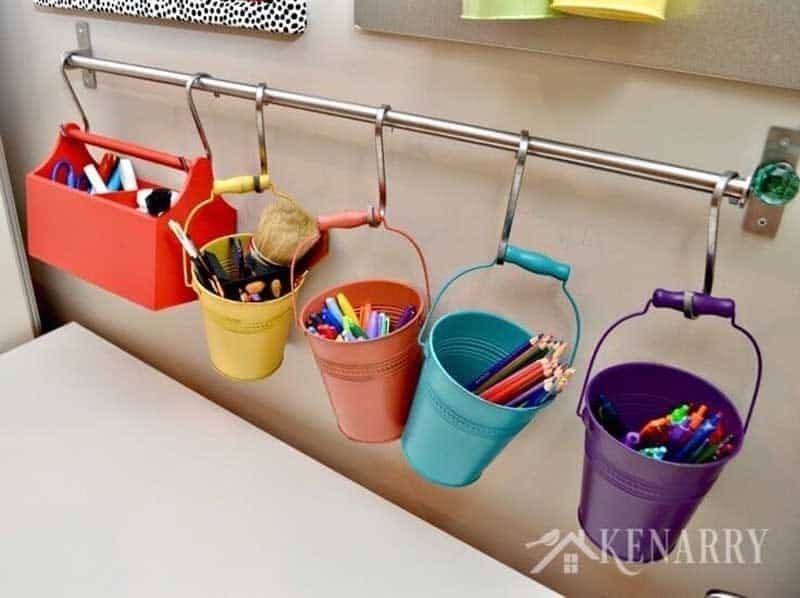 And this dowel + hook storage method is easy, inexpensive, and looks great. 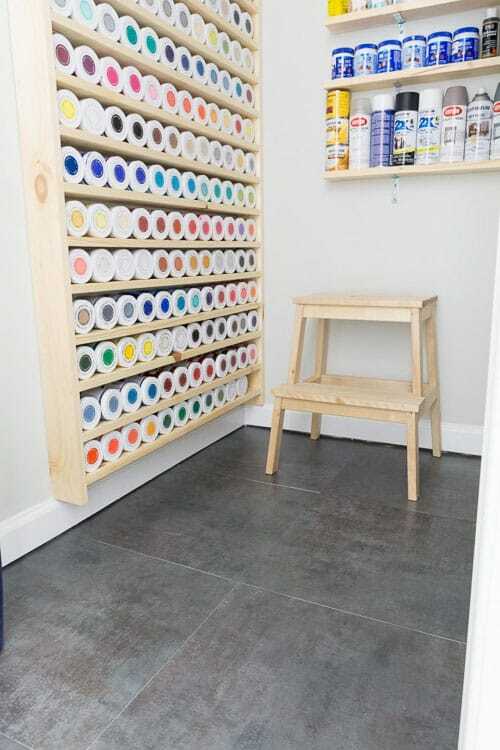 What a great idea for storing all those acrylic craft paints, right? Full tutorial on the madincrafts.com blog! 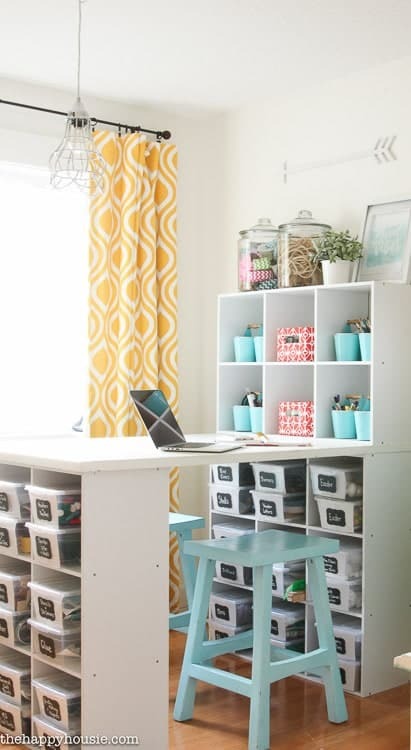 Isn’t this craft space lovely? So cheery and colorful. This is another great craft room tour FULL of great ideas for how to store this, that and the other. Bethany creates amazing things. Period. Always really original. Always very artistic. And this one? Super useful to boot! Not only does it hold a lot of markers/pens/coloring pencils, etc. but it rotates, too! 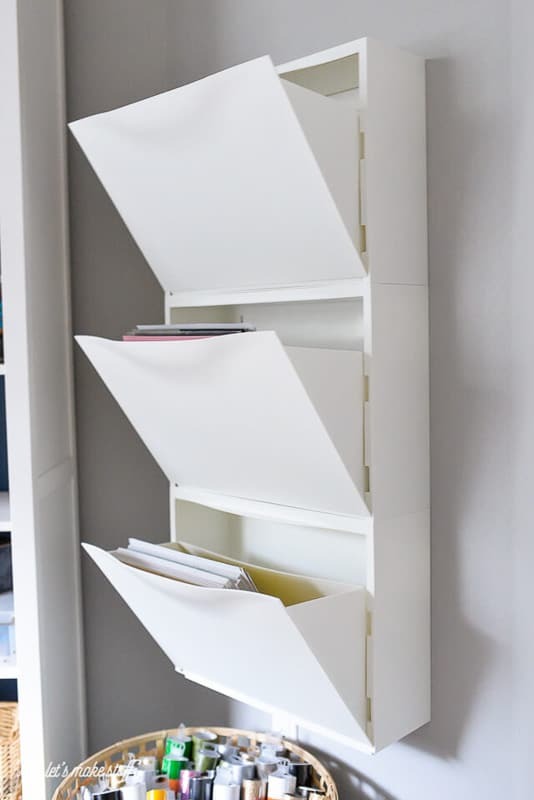 Another Ikea hack from yours truly. Made from a utensil holder that set me back a crazy $2.50. 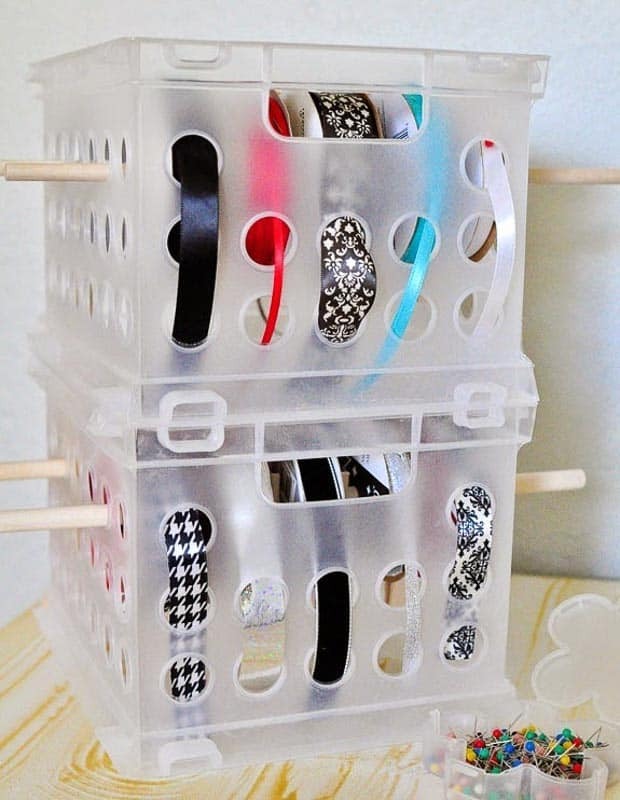 Makes such a sweet little ribbon organizer. Don’t have an IKEA nearby? You can find these on Amazon, too. I don’t even own sequins because just the thought of having an unorganized mass of these teeny tiny thingamabobs gives me cold sweats. It’s like Legos all over again, although much less painful if one were to step on them. 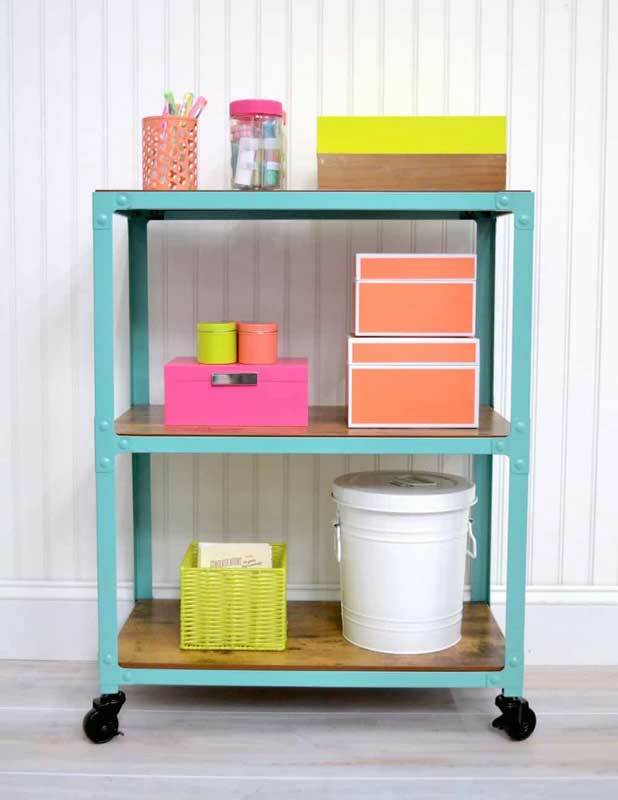 But this storage idea is pretty smart. Almost makes me want to buy some sequins. SO cute, right? 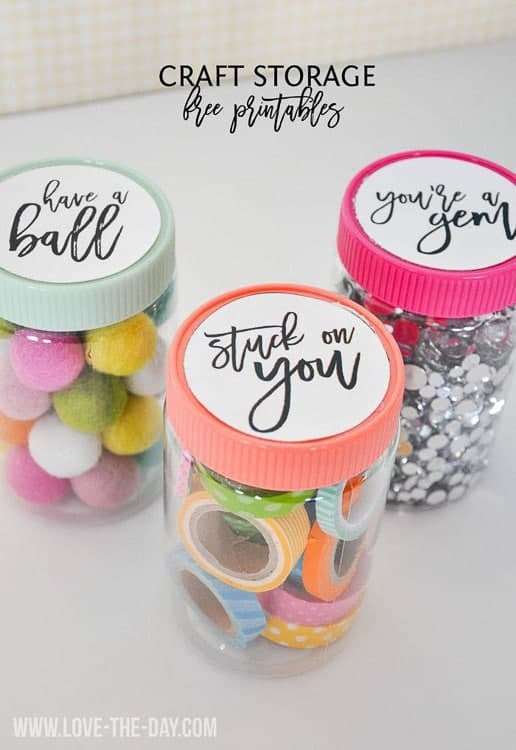 And if you head to her blog post linked above, you can download these free printables to label your own storage containers. 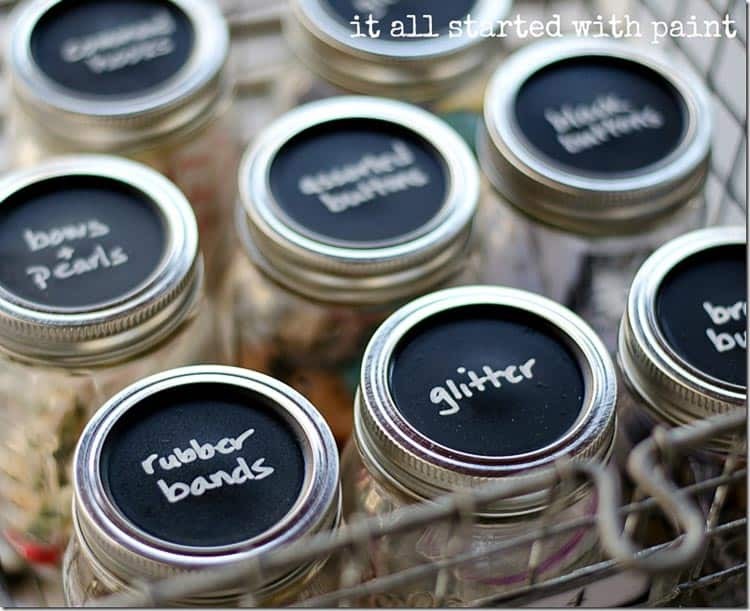 Mason jars make such lovely storage, so I’m super partial to this craft storage idea. 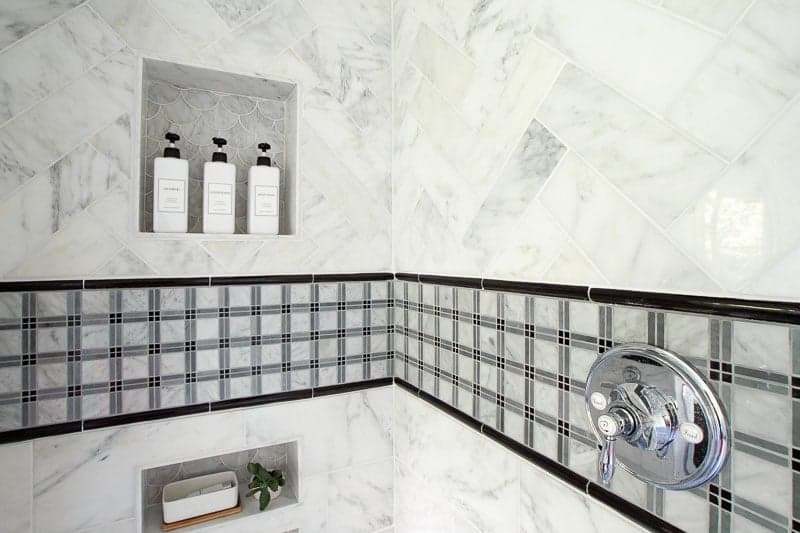 This is one that I plan to try in my own home, for sure. Almost always when I look at anything Jen does I end up staring blankly at my screen for an embarrassing amount of time trying to figure out how the heck she makes things look so good that are usually such sources of clutter and mayhem. 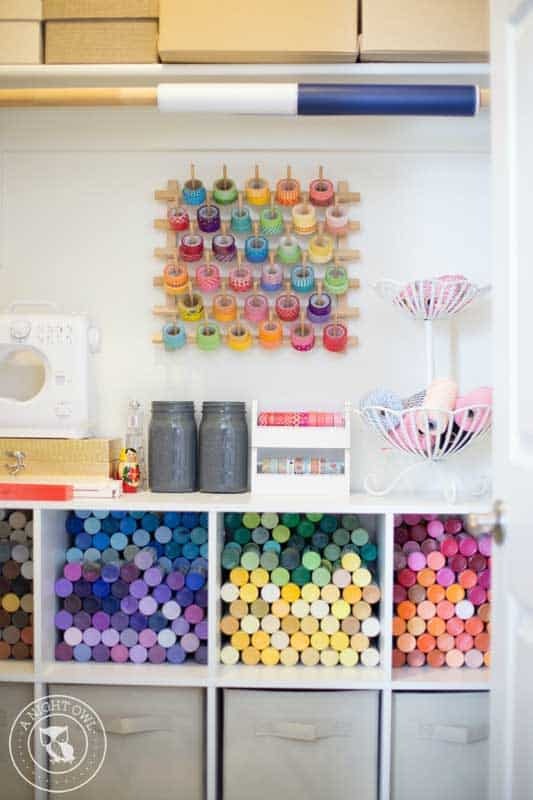 Her craft room is a work of art. I mean, look at this wall alone! You could put this on a canvas and hang it above your fireplace. It’s just gorgeous. I mean, come on. This is one STUNNING closet, right?! Look at all that paint! So pretty and colorful, and ORGANIZED. I’m in total awe. I’m not sure what it is about Ikea products that give me the sudden urge to organize, but that seems to be the case. We found another great use for this $2 Ikea plastic bag dispenser. 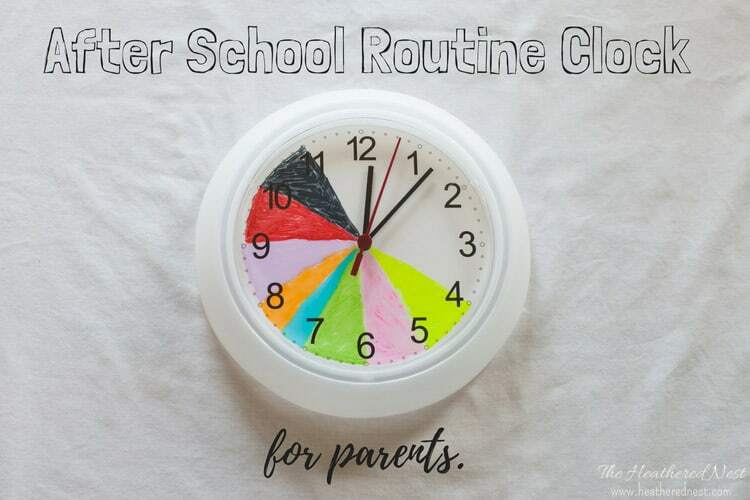 It hangs inside our “craft closet” and for only a $2 investment, we think it does a pretty amazing job. No IKEA? No problem. Here’s another source. Admittedly, I know nothing of yarn, or crochet, or knitting. But I could get used to having this attractive yarn storage at home. So smart! 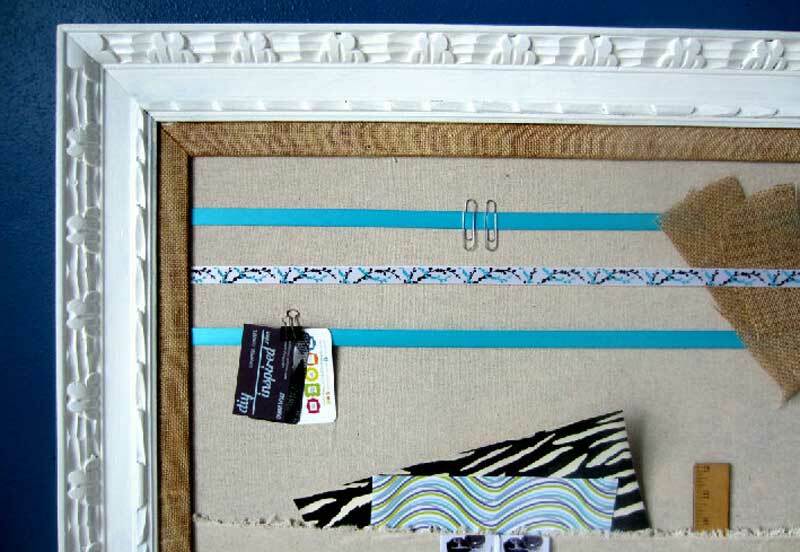 Take a look at the tutorial for upcycling picture frames into craft storage. Love it! Aren’t these the sweetest little things you’ve seen all day? 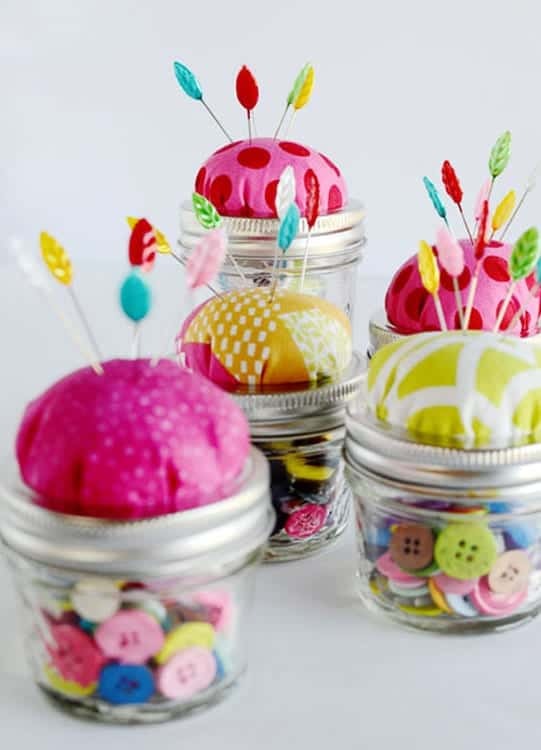 I will definitely be making one of these little pincushion storage containers! Karisa’s office/crafting space is one of my ABSOLUTE all time favorites. 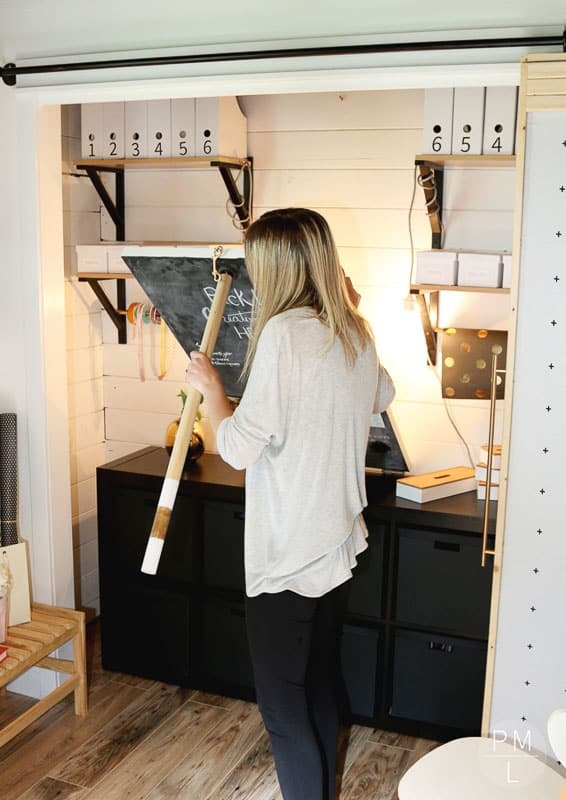 It is chalk-ful (yes, CHALK, not chock) of brilliant space-saving DIY ideas to maximize the function of a small area. And beyond that, it’s gorgeous. 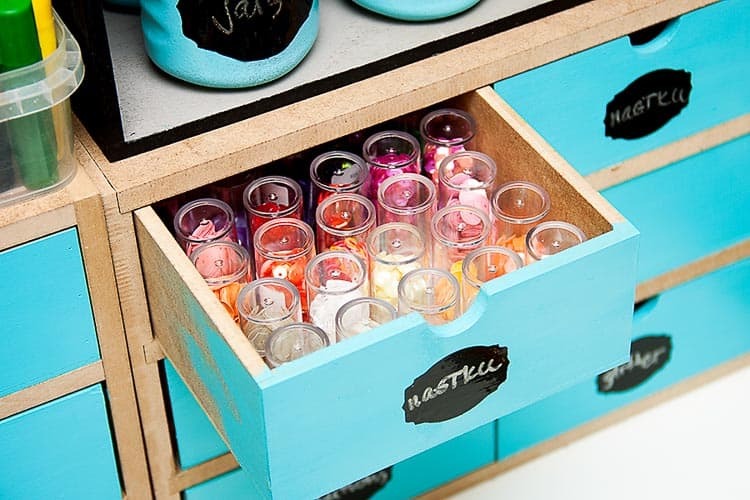 Little drawers are great for holding little crafty things! Great upcycling idea, right? 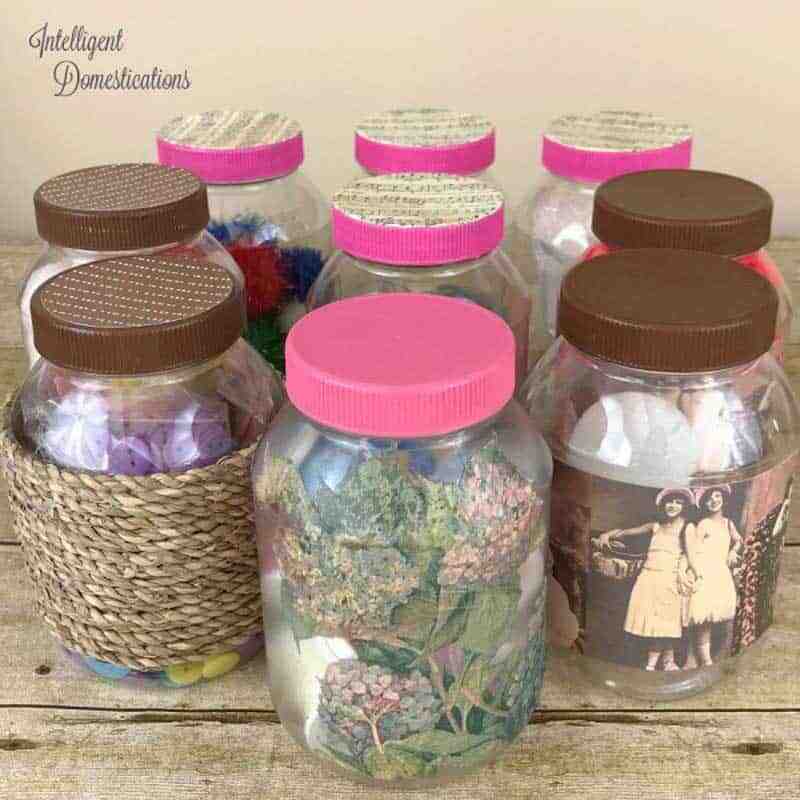 And the size of these jars is perfect for all kinds of crafting items. 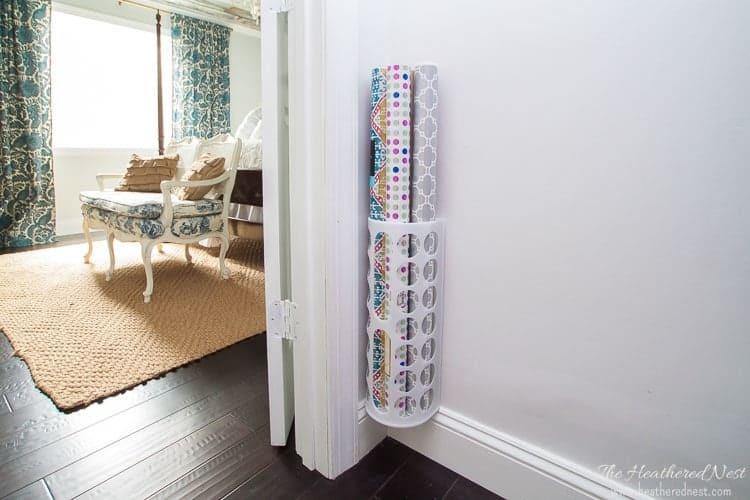 Monica shares a great ribbon storage solution for small spaces. And her idea for spacing out the ribbon? Genius. 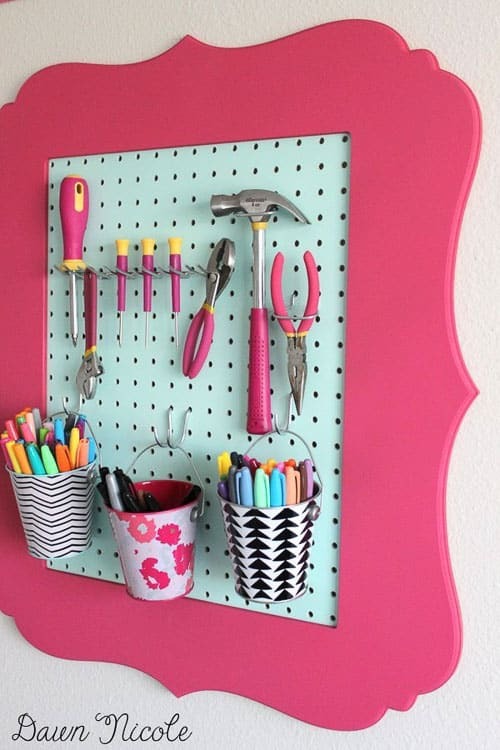 Dress up a pegboard for more of a finished look. It’s a seat! No, it’s storage! 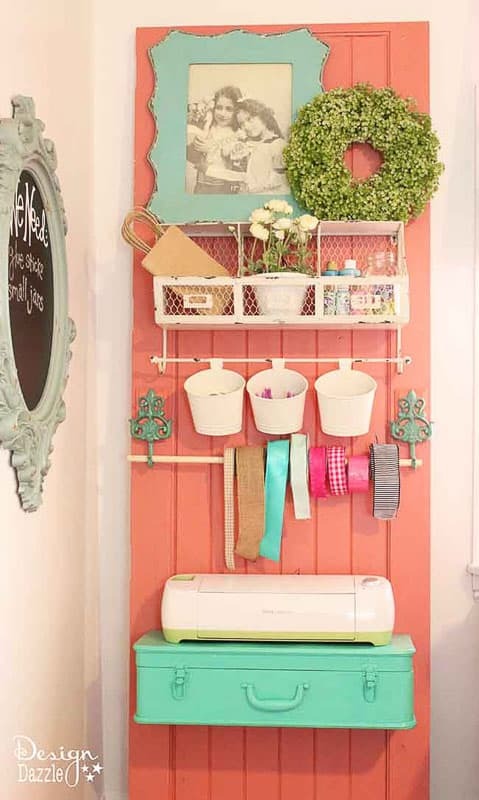 Great idea for crafting in small spaces. 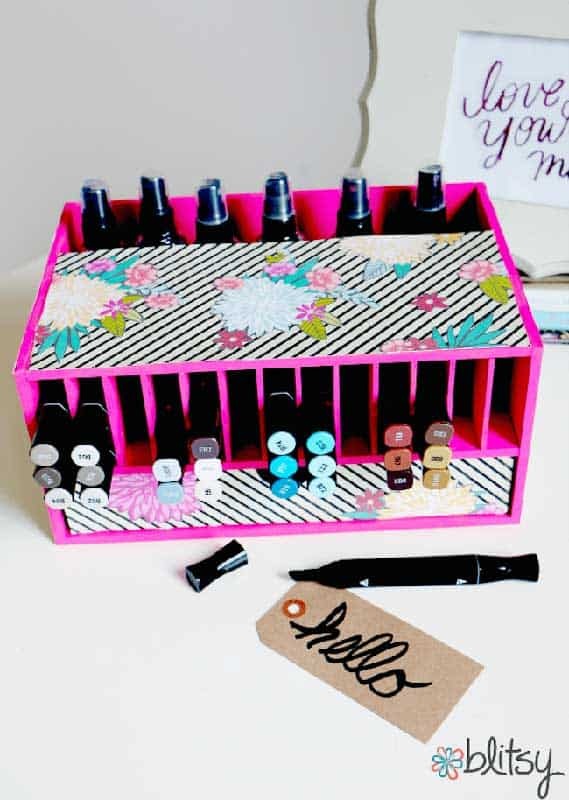 Not only is this button organizer functional, but it’s also beautiful to boot! 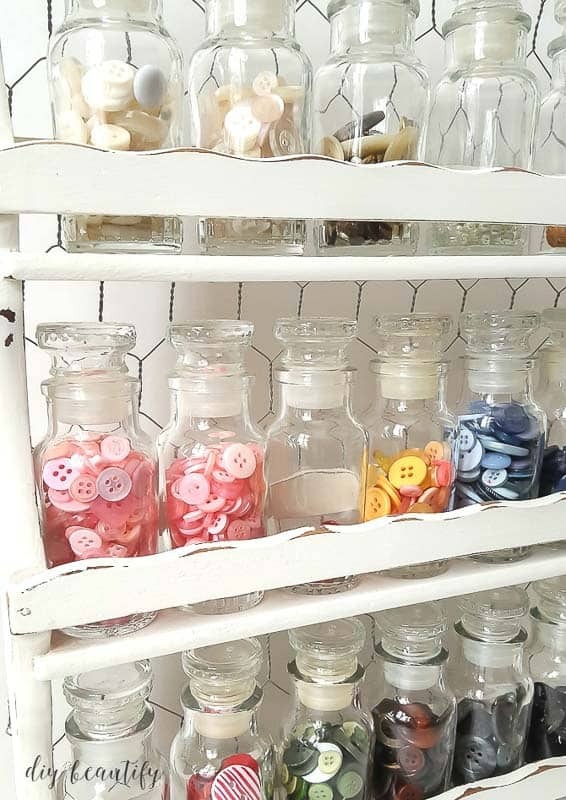 What a great use for a vintage spice rack from Cindy. Makes me want to scour some flea markets for one of my own to doll up! 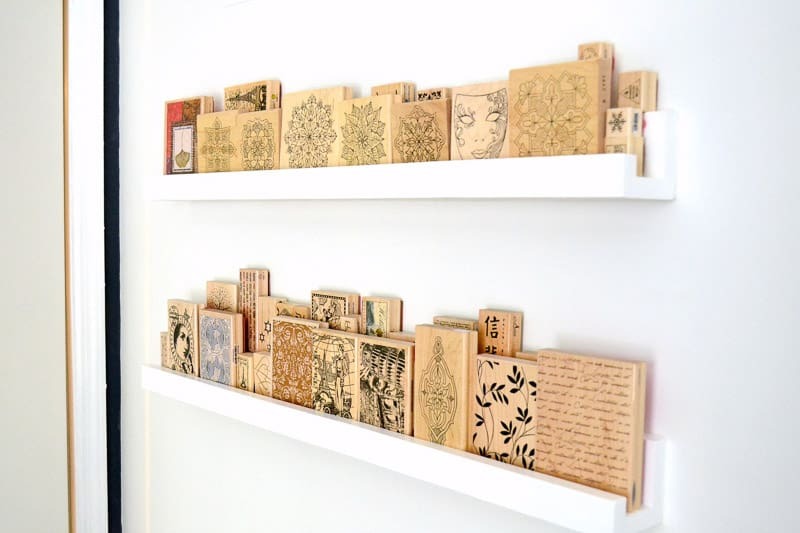 If I didn’t read Chelsea’s post, there’s no chance I’d have guessed these beauties were made over cardboard boxes. 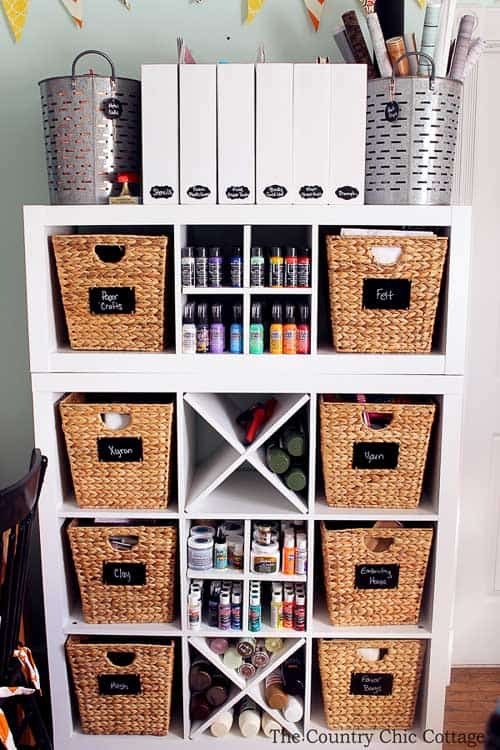 Her method is simple and smart, so check it out if you want to gussy up some more craft storage bins! 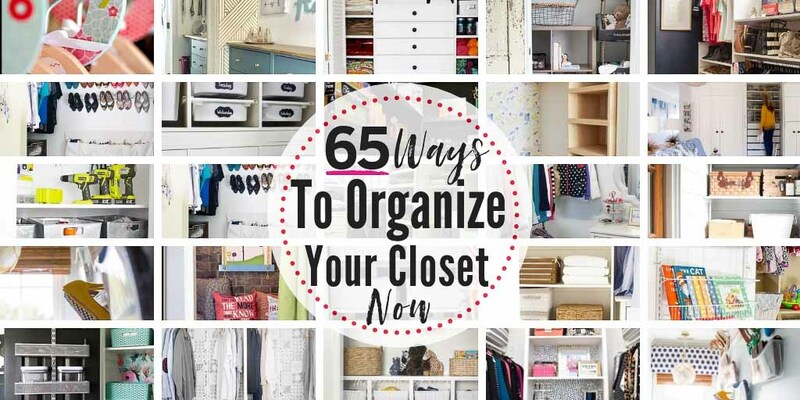 People talk about “cloffices” a lot now…a home office made from a closet? Well, Becky made a “sewffice”. 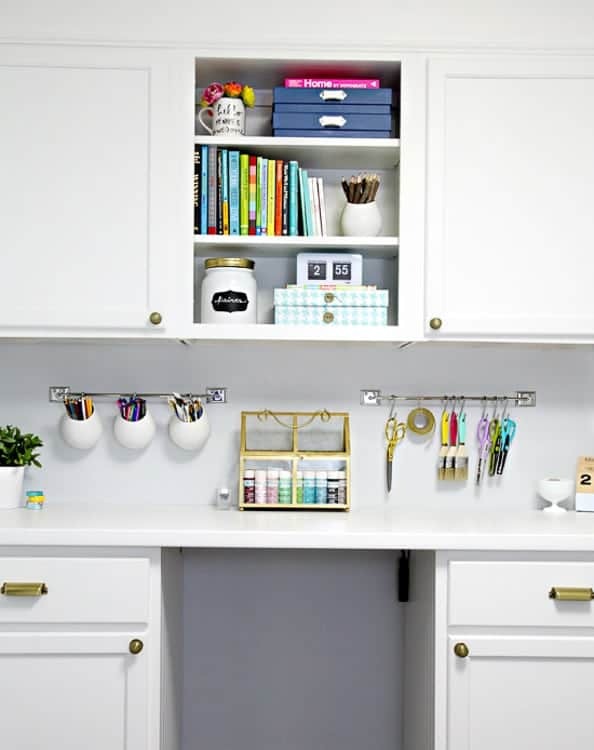 Check out the brilliant ideas in her three-post series about the transformation of a closet into a gorgeous sewing space! My favorite idea of hers is her mini fabric bolts. 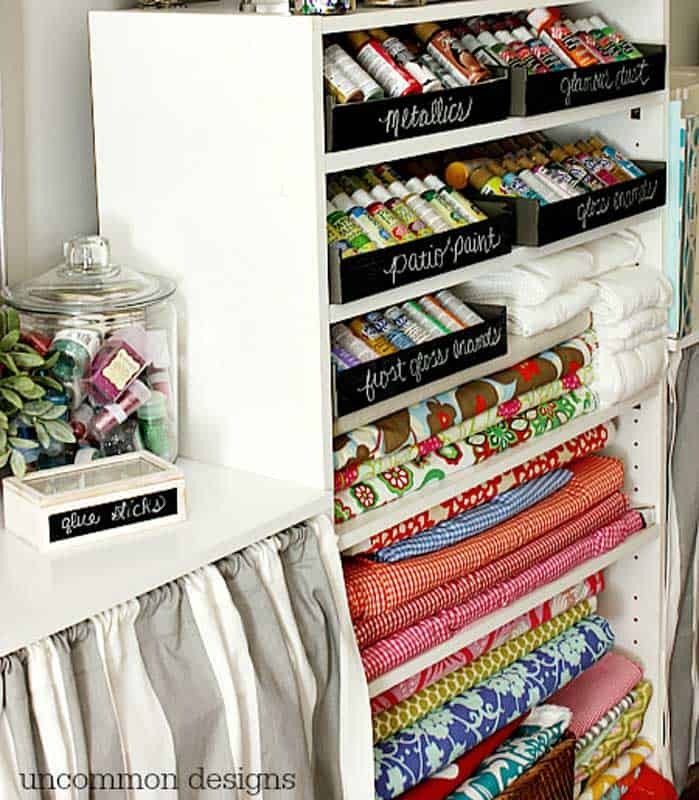 Smart way to neatly stash fabrics. 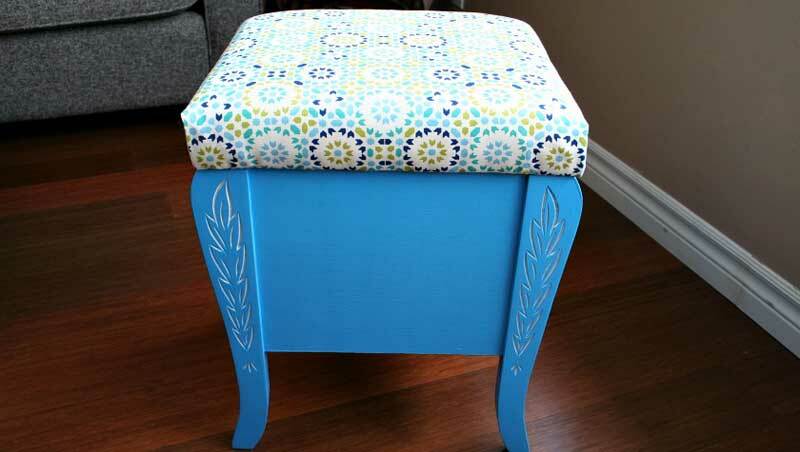 Make an old item new and helpful in your crafting space. 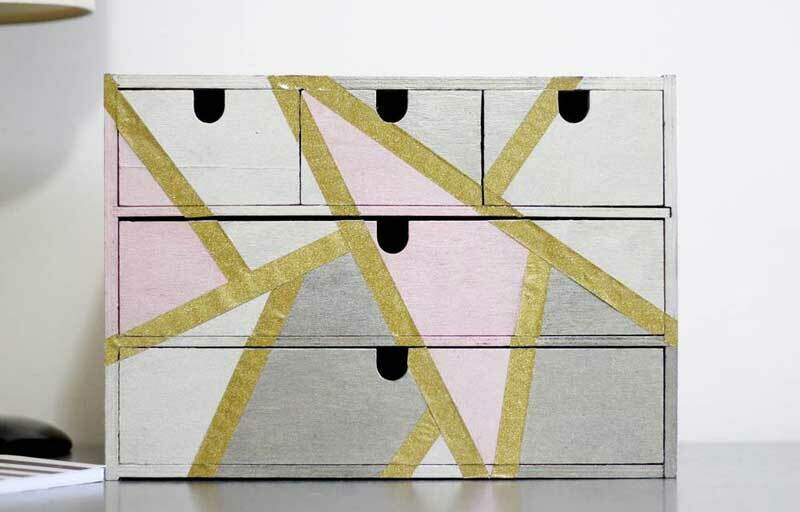 Easy and attractive plan for storing tape rolls. I’ve never used a Cricut or Silhouette tool, but I know lots of people who do. 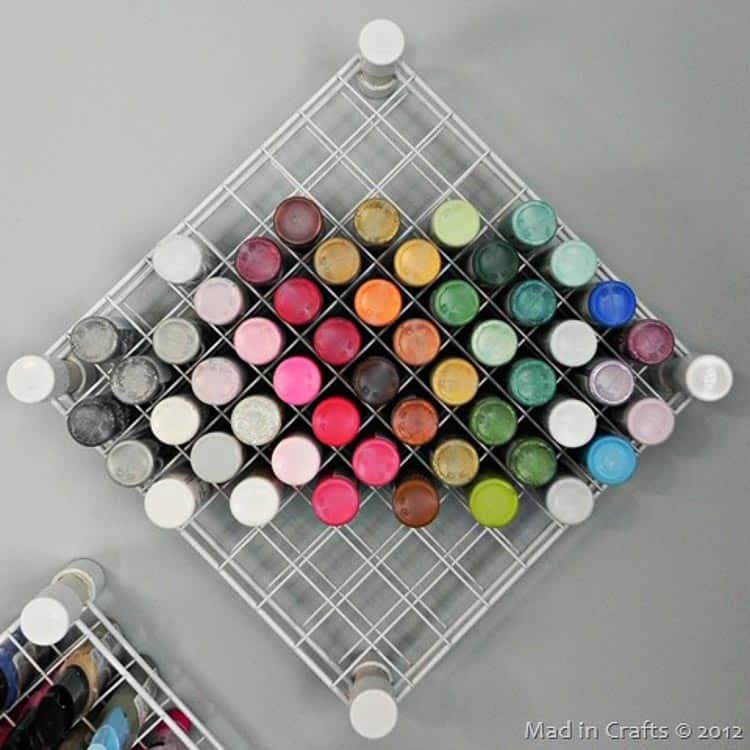 This seems like an easy and helpful organizing solution for all the materials you need for those kinds of projects. 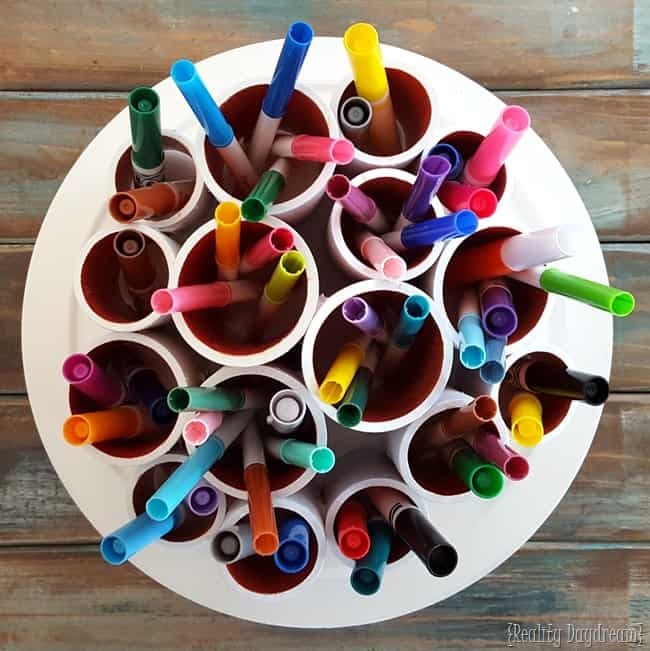 When you have lots of markers, you need an organized way to stash them. I’d never even thought of stocking up on greeting cards before. But now I might! 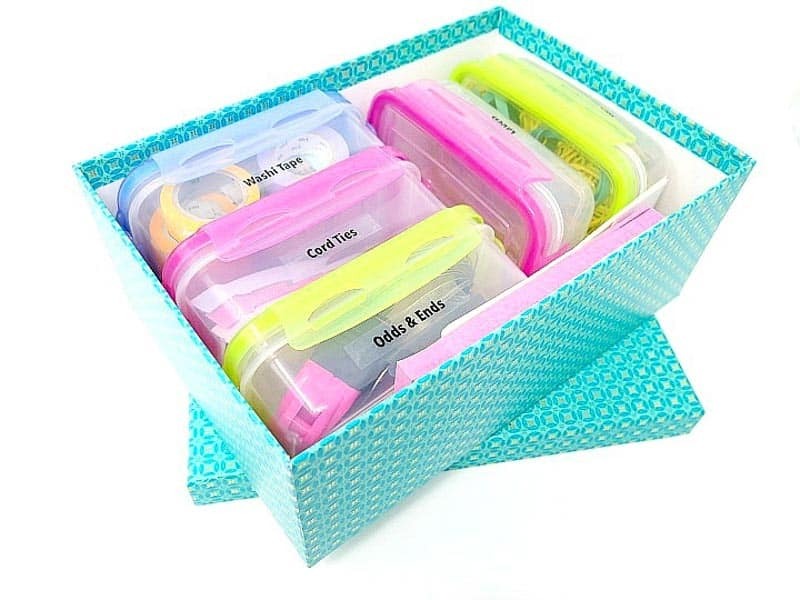 Need a place to keep your thread? 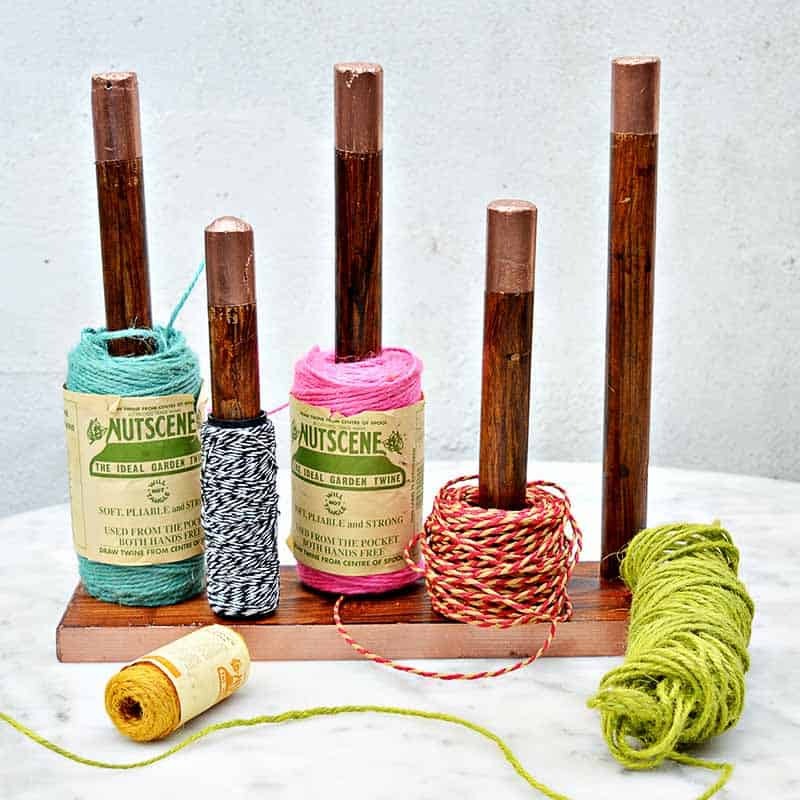 There isn’t a better solution than an actual thread rack. But check out the little addition made up top in this tutorial. 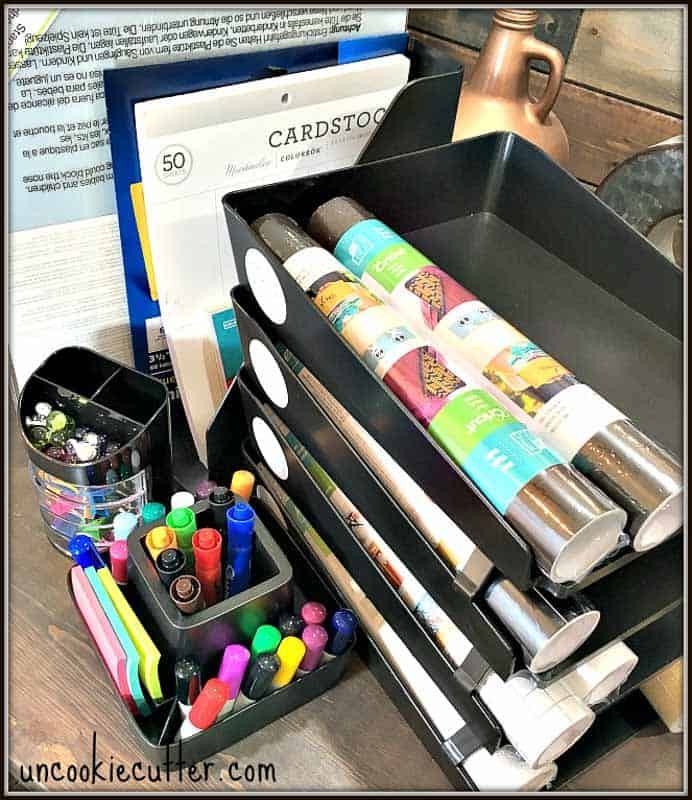 As you would expect from a smarty pants organizing blogger, Lindsay’s craft organization post is FULL of fantastic ideas for organizing all the bits and bobs in your crafting space. 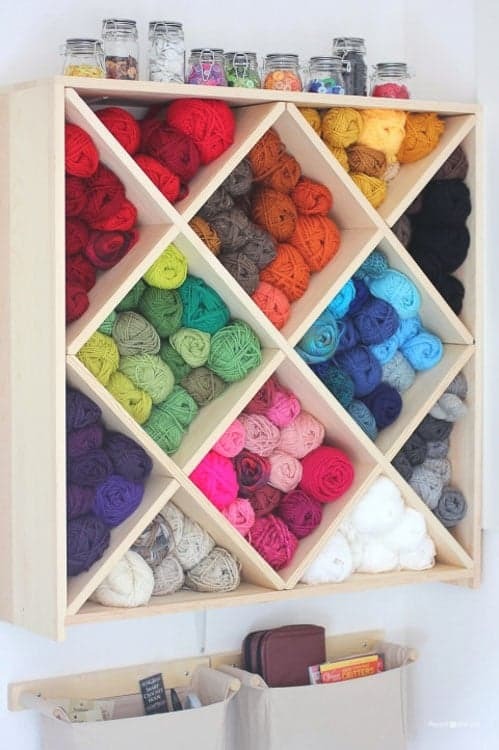 One of my favorites she shares is a great way to neatly stash some of the smaller craft items. 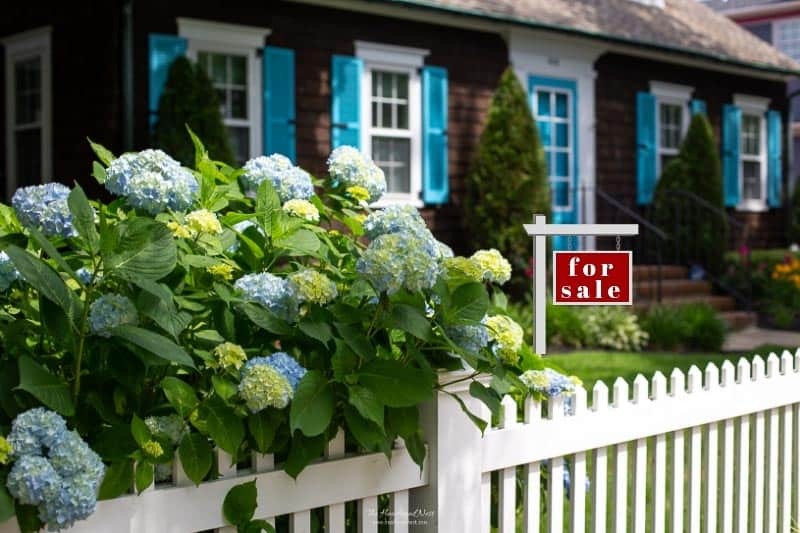 Her post will give you more info and lots of other ideas. 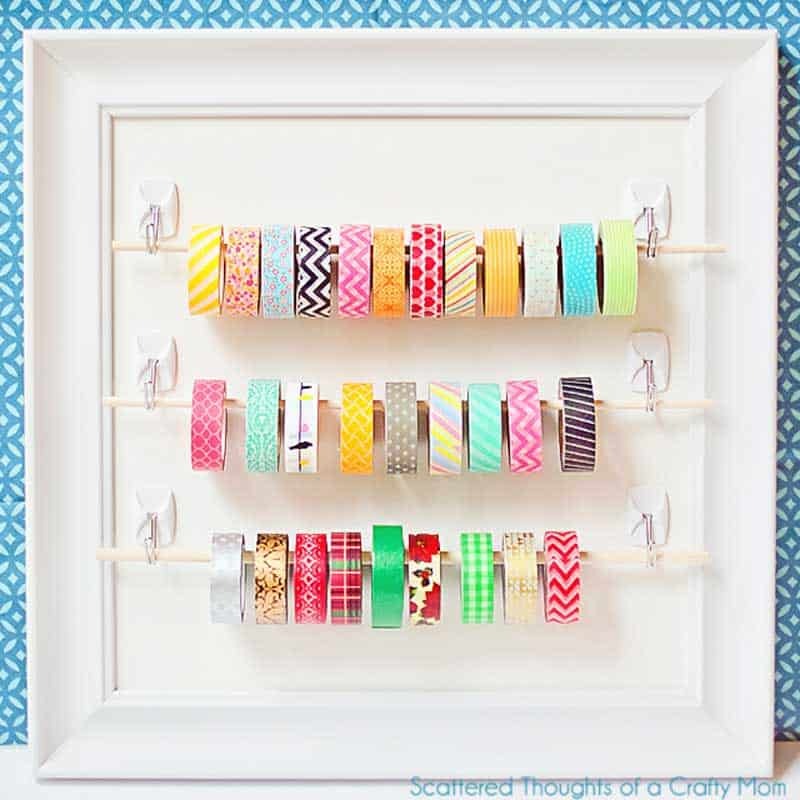 I gotta say, I love Claire’s washi tape and twine dispensers that she shares in this post. But my FAVORITE crafting idea is her crafting cabinet. This is a woman after my own heart. Alongside all her crafting supplies, check out what she stashes on the top shelf of her beautiful storage cabinet. 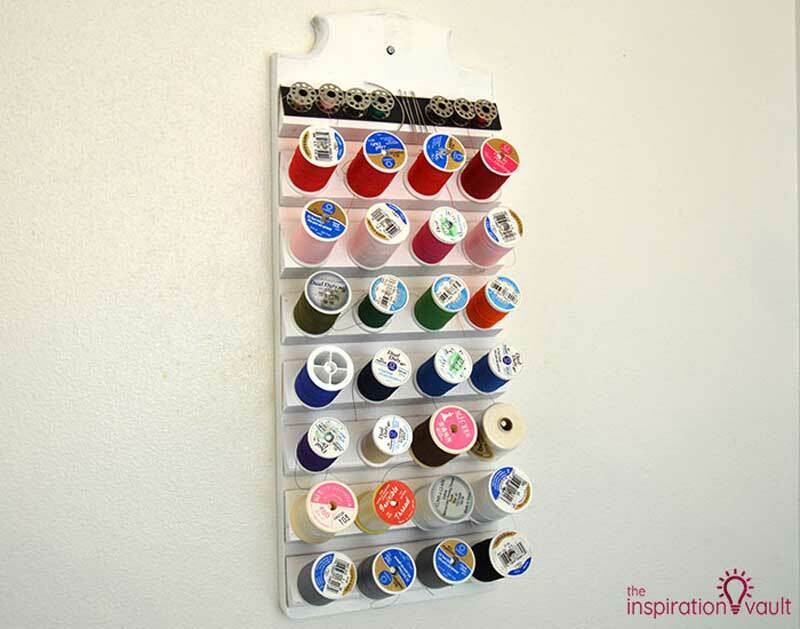 Since many people craft in unused bedrooms, or transform a closet into a crafting space, this idea is a great way to make use of the closet organizer that may already be there. I hate to think of good wine being evicted…but at the same time, I kind of think the yarn makes for a prettier display, am I right? 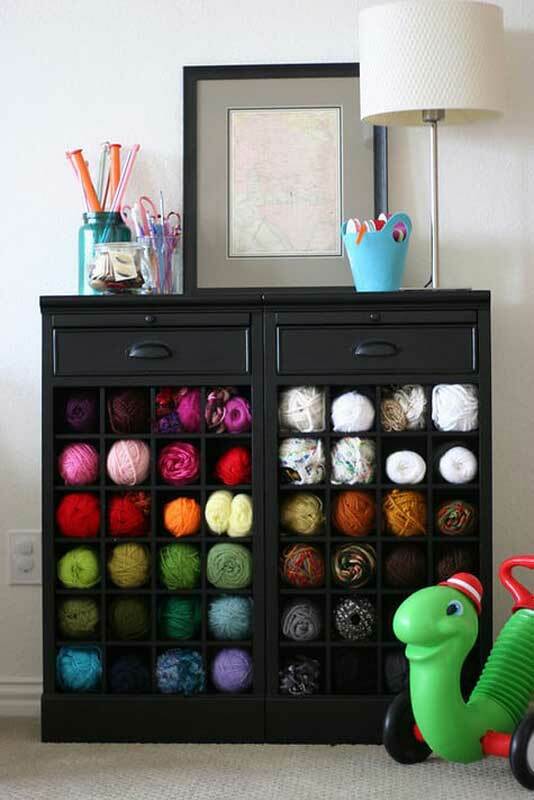 Love this idea as many of us have an old file cabinet that we could easily transform. 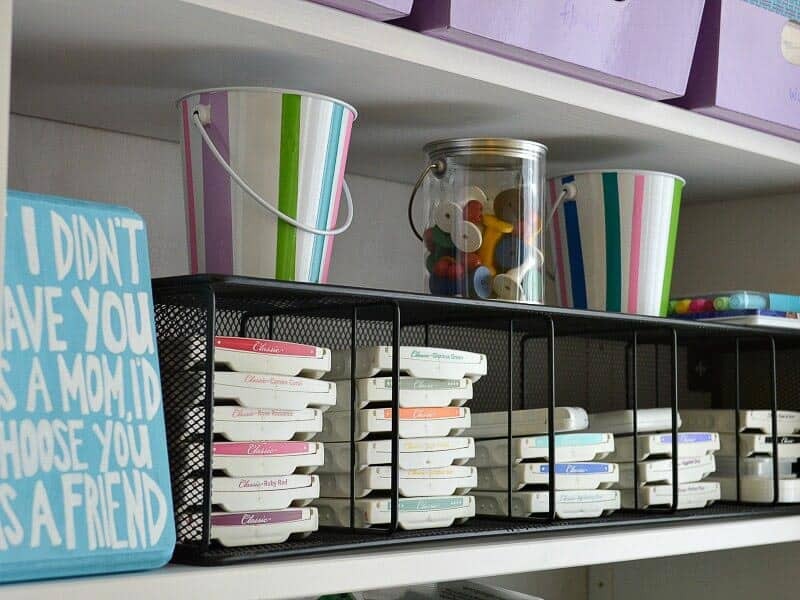 My friend Carrie has some great storage and organizing ideas. 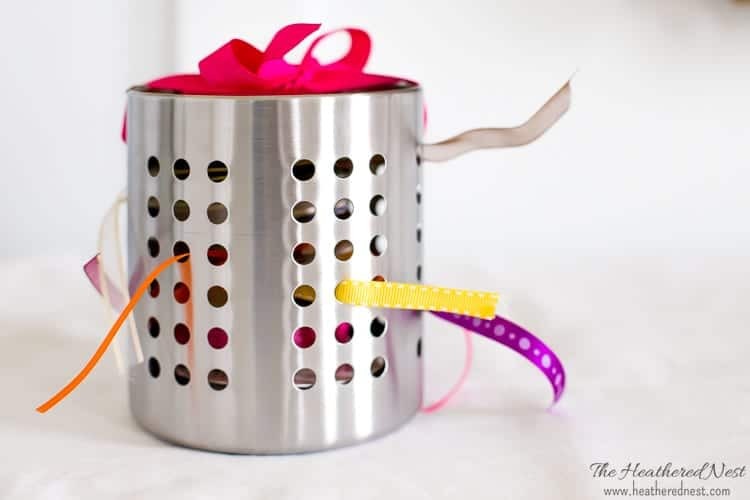 And this is a great one for crafts, isn’t it? Even if you don’t like crafting, why wouldn’t you create a space for it when it turns out looking so happy and fun? 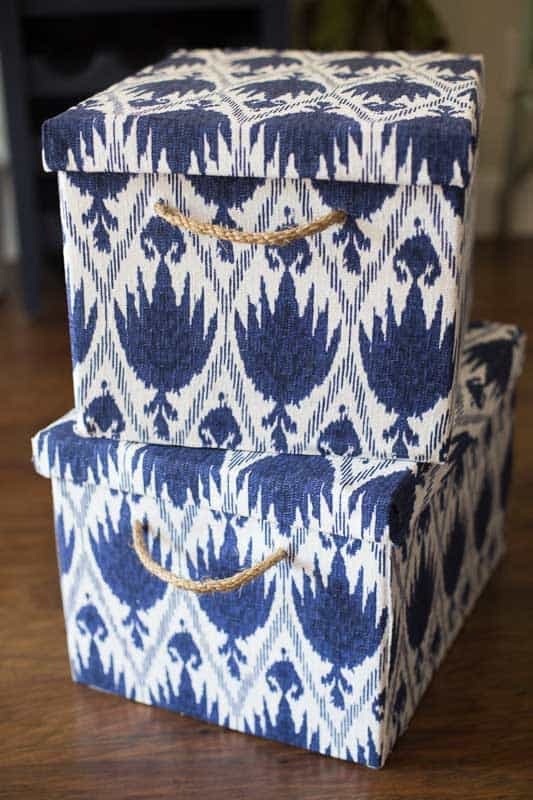 Trish shares beautiful, and inexpensive ideas for creating functional craft storage bins. Isn’t it great when smart people find smart storage solutions to share? 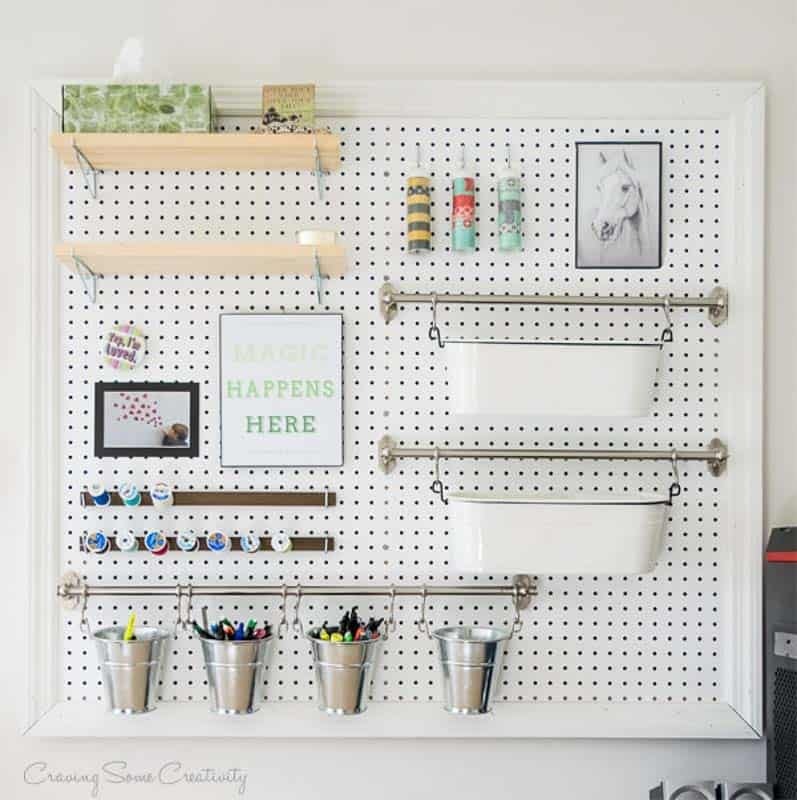 Look how Sarah turned what would have been useless square footage into something super helpful for her crafting supplies! I am so smitten with Toni’s craft room. It would be a crafting dream to jump through the screen and start working on a fun project in this space ANY TIME. And this vintage door organizer is not the only gem in this craft room. 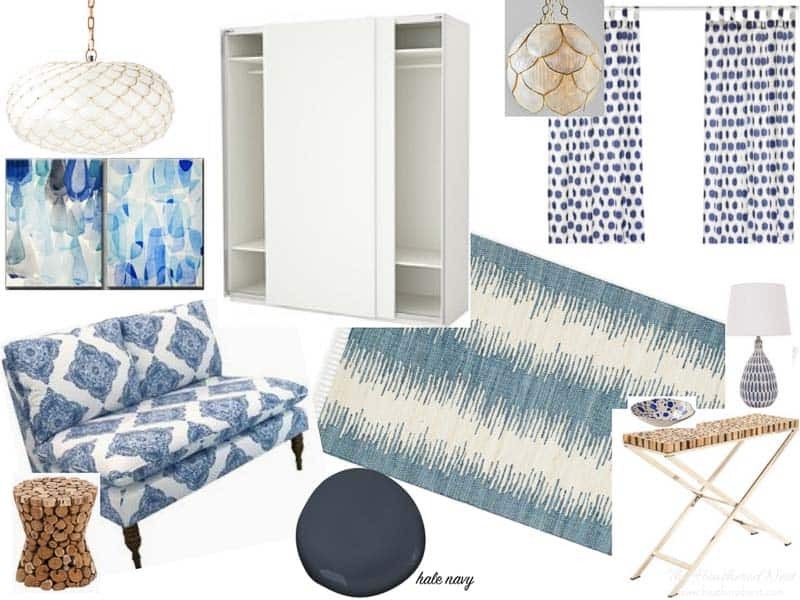 Wait till you see the other beautiful furniture she flips into crafting gear. Amazing. 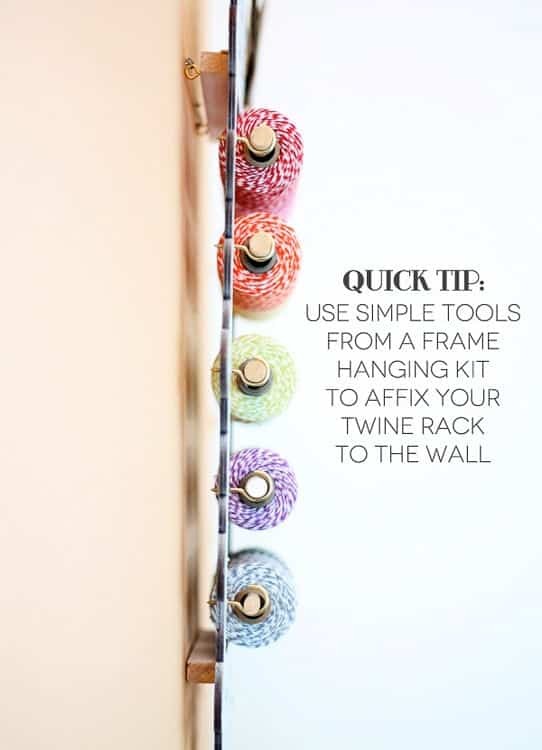 Smart and inexpensive solution over at Randi’s house for stashing her yarn collection. Marci likes the old $3 Ikea Varieras, too! 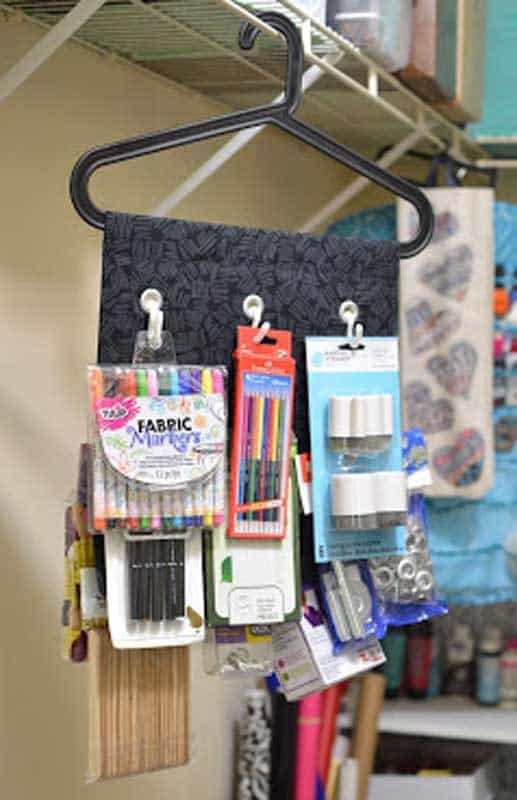 There really are so many uses for them (we did a whole post of ideas for using this $3 plastic bag holder). 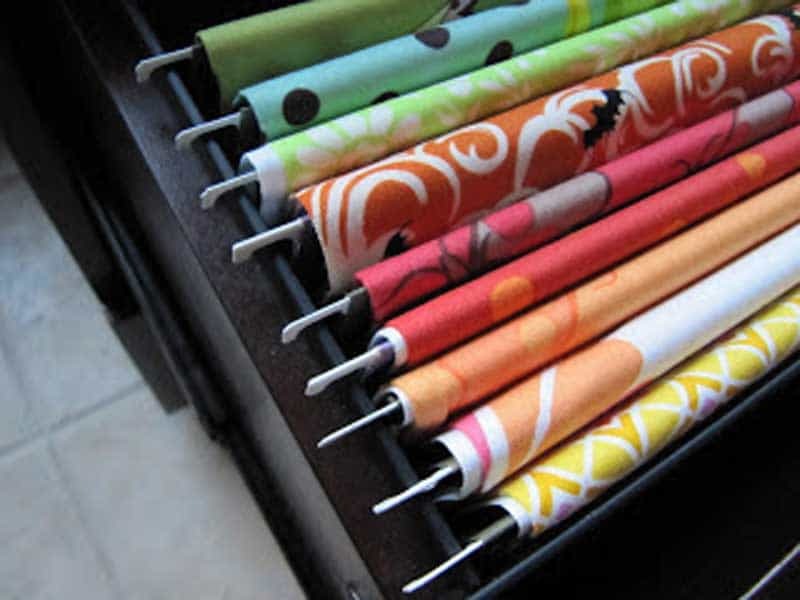 She has a large collection of vinyl rolls for her Cricut so this is a perfect solution. 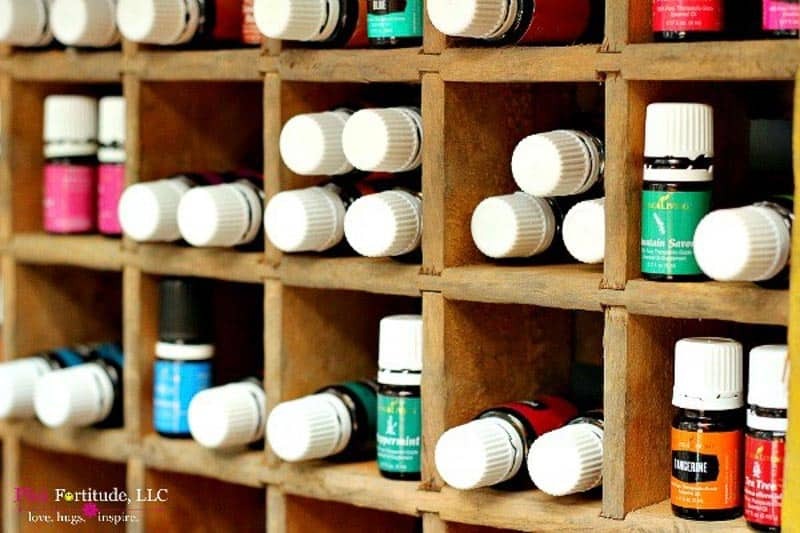 I realize essential oils aren’t really crafts, but I thought was a great use for a vintage Coke crate which many of us have. 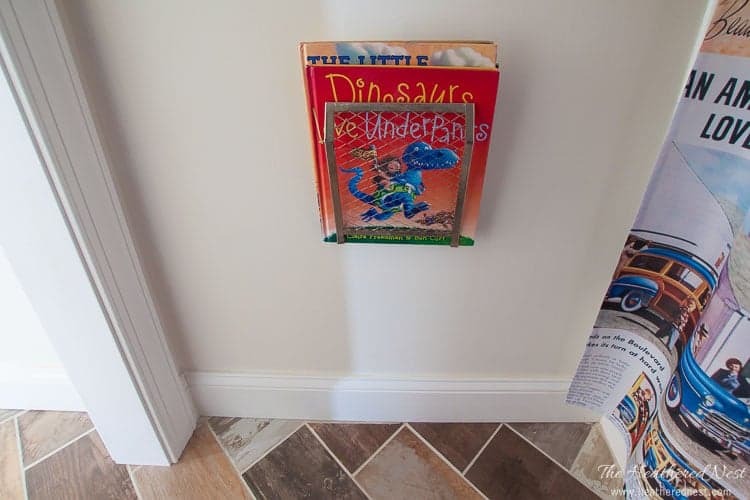 I have a couple of these I use to decorate with but haven’t really found actual practical uses for, so I was happy when I came across this idea. The bottle holders are just the right size for small bottles of oil…and probably other small things like buttons, paper clips, acrylic paints, etc that are kept in a crafting space. I love how Susan repurposed something that many of us who lived through the 1990s had many of in order to stash her ink pads in a neat way. 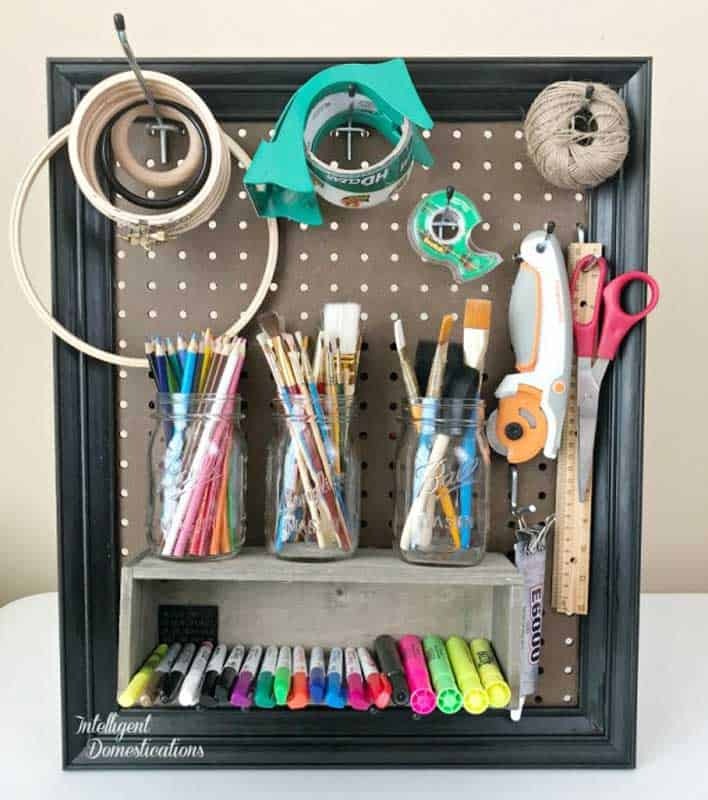 Rachel has a great tutorial for making and setting up a useful (and pretty) DIY pegboard for storing craft supplies. I love Maggie’s creative use of clipboards for storing fabric swatches. Would make them really easy to flip through while you’re in the midst of a project. 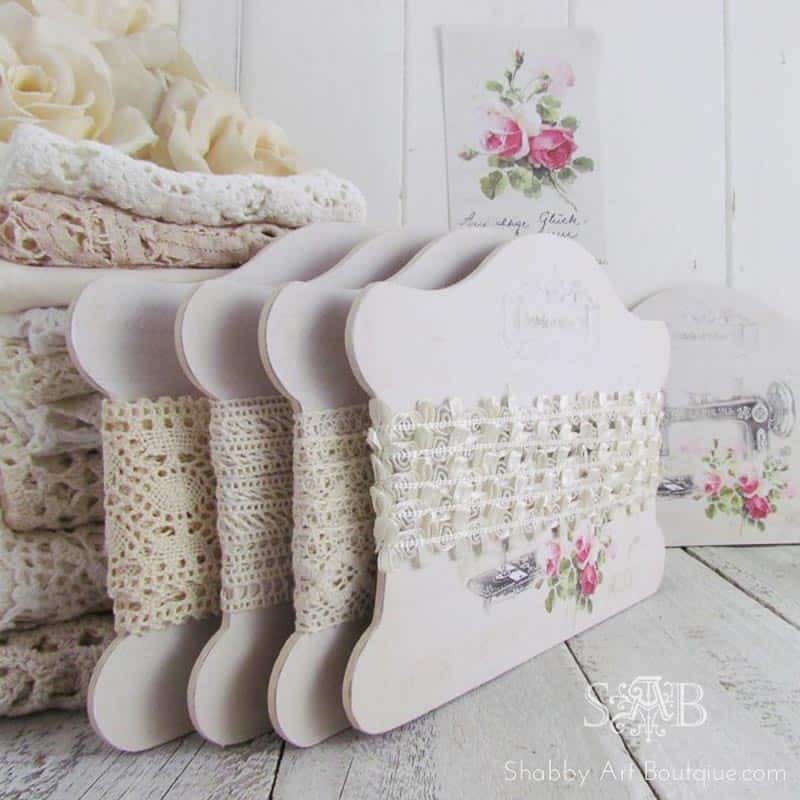 If you’re a fan of all things shabby chic, you will love Kerryanne if you don’t know her already. And you’ll also adore her craft space, which is full of DIY’s, all made in her beautiful shabby chic style. 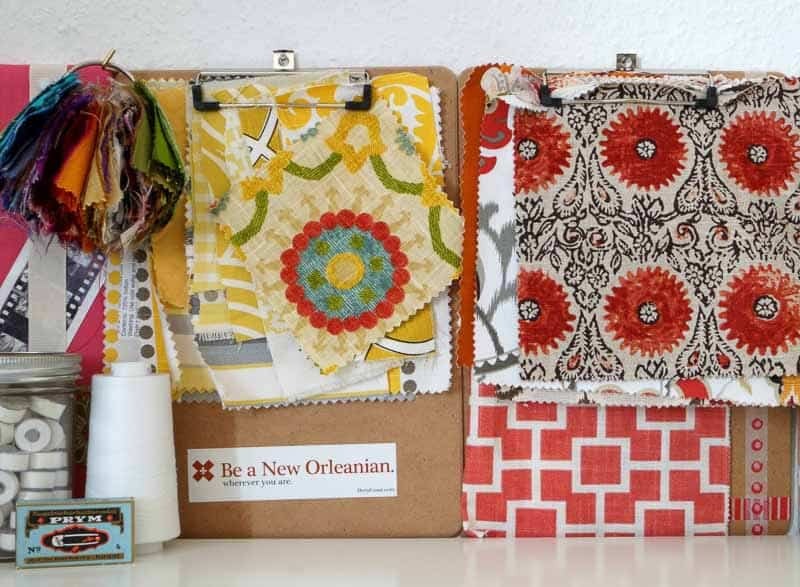 Not only are her craft storage projects beautiful, but they are really practical as well. This is one of my favorites of hers. 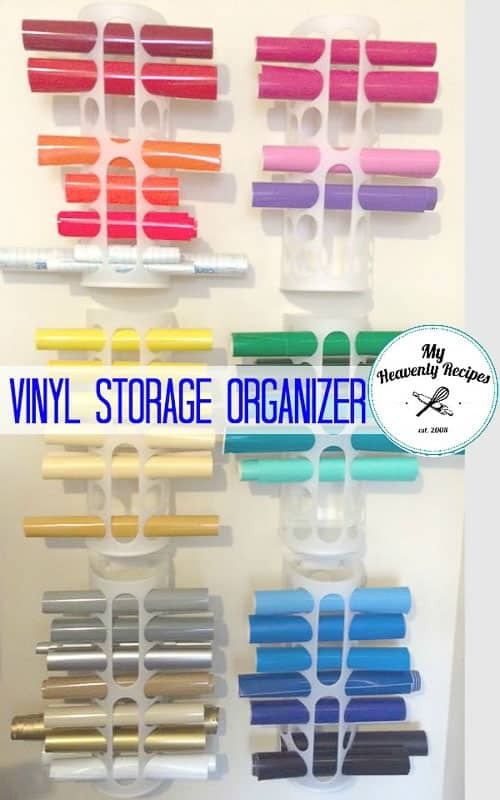 April uses something many of us already have at home and repurposed it to store her vinyl. Quick, easy and effective. 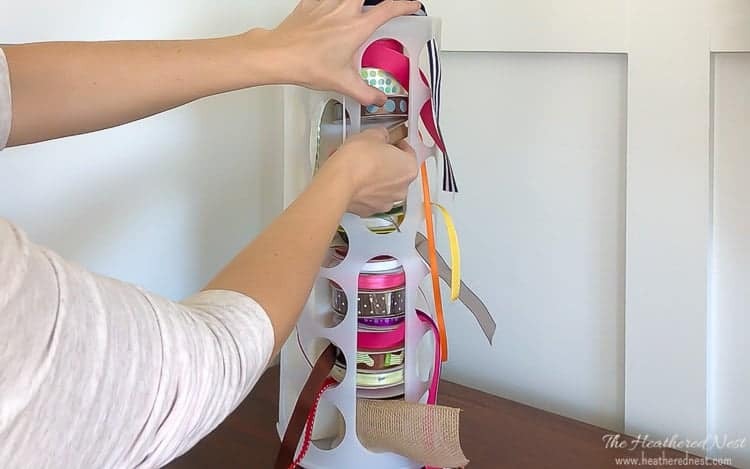 Cori has a perfect Ikea hack for storing all her crafting paper. And it uses an inexpensive Ikea find. 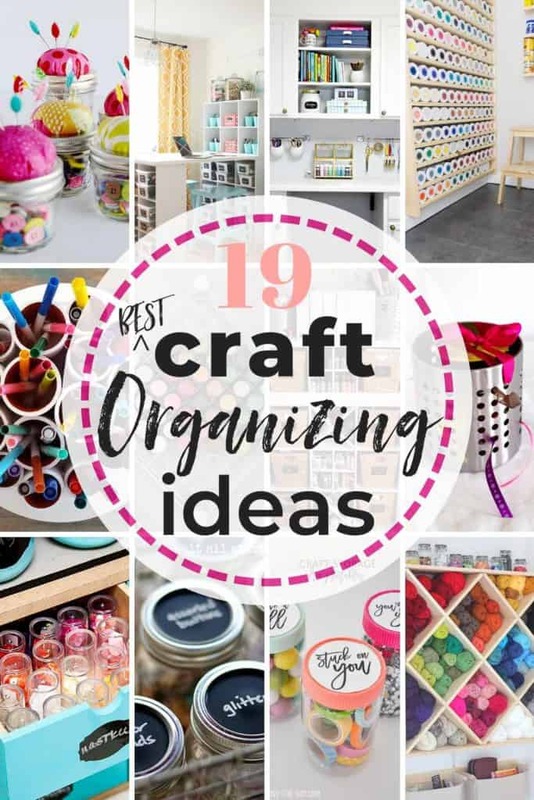 I sure hope that you’ve been inspired by some of these fantastic craft organization and craft storage ideas! Happy crafting all!! You are WELCOME! I love your idea. I’m totally going to use mine for the same!! Oh my word, MJ! You and I would get along famously!! Laughed my way through your whole comment…not AT you, but WITH you since it sounded so familiar 😉 Cheers messy friend in arms! Thanks Brittany! Love your closet!! !